Train sooner and recover faster with the Alter G Anti-Gravity Treadmill. We’ve leveraged industry-leading technology to bring you an easier, safer and faster rehabilitation. With more freedom, greater precision and broader application we are able to meticulously treat our patients to enhance their physical function for better mobility, health and performance. The Alter G Treadmill allows us to harness the power of NASA - patented technology to make your recovery seamless. By reducing your body weight by up to 80% you can train with less impact, less stress on joints and get back on your feet in less time. 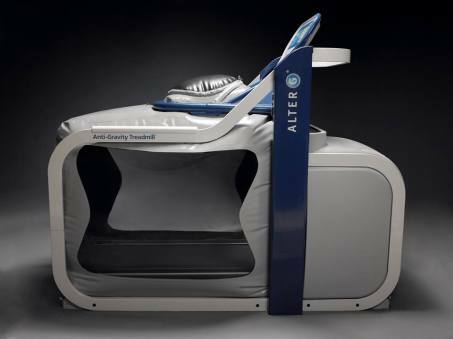 Through the use of differential air pressure, the Alter G acts as a zero-gravity treadmill to help recover, maintain and enhance physical function with more freedom and greater precision than ever before. Whether you are an orthopaedic patient looking to rebuild your strength, you suffer from a neurological condition and need to regain mobility in a risk-free environment, or you’re an athlete trying to maintain fitness during injury, the Alter G can be tailored to fit the needs of your unique physiotherapy journey. Once a patient regains enough mobility after surgery or injury, the first step in the treatment process will likely be a walking program. We use the Alter G Treadmill to precisely adjust your impact and gravitational forces while we take you through a routine of walking, running and closed kinetic chain exercises. By only using a percentage of your body weight, we can begin your recovery process sooner and set a personalized timeline based on your needs. You don’t have to worry about falling in the Alter G. Built to be fall-safe, you can rest assured that we will guide you through your session safely while achieving earlier mobility and increased range of motion. The Alter G significantly reduces your chances of developing gait abnormalities and your transition to walking without the aid of an anti-gravity treadmill will be smooth. At Elements, we move at your pace and ensure that you feel ready and secure with each new step in the recovery process.